WanderLearn with Francis Tapon is creating podcasts, videos, and writings! My name is Francis Tapon and I'm a travel writer, podcaster, video producer, and part-time idiot. I exist to inspire, educate, and entertain people to wander and learn! I just finished my 5-year nonstop trip where I have been traveling overland through all 54 African countries. Along the way, I got strangled, burglarized, and married—and all that happened in one country. Imagine what happened in the other 53 countries. Now I'm working on my third book, a podcast show, and a two-hour documentary, which will be based on my electrifying and profound African odyssey. Would you like to be rewarded for helping make all those things happen? If so, join my exclusive Patreon group! Instead of raising a bunch of money in a single month, artists raise a little bit of money every month. You can become a patron for as little as $2 per month. The more you sponsor, the greater your reward. Why do I have a Patreon page? Being an independent travel writer is about as sustainable as living off of non-renewable fossil fuels for the next 1,000 years. I've looked for ways that I can keep producing content sustainably. For instance, in 2014, I ran a successful Kickstarter campaign and delivered its promised goal: a pilot TV episode. Although I raised $24,075, that 30-day campaign took a ton of effort and all the money quickly went to pay for making the pilot and fulfilling the rewards. The pilot episode has not yet led to a TV show that could supply me with reliable income. I prefer Patreon's model over Kickstarter's model because it emphasizes a long-term relationship and monthly deliverables. I'd rather raise $2,000 every month than $24,000 once in a blue moon. I want to give my patrons something remarkable regularly instead of once every few years. Every week, my mom asks me what I will do with my life. She believes my way of life is unsustainable. I disagree. I believe that if you produce useful, educational, and entertaining content, then some people will support your projects. Exclusive content that you can only get here at Patreon. The ability to boss me around so you can influence my output. A shout-out if I pick you as my Patron-of-the-Month. My help (I like to help those who help me - it's that Golden Rule thing). 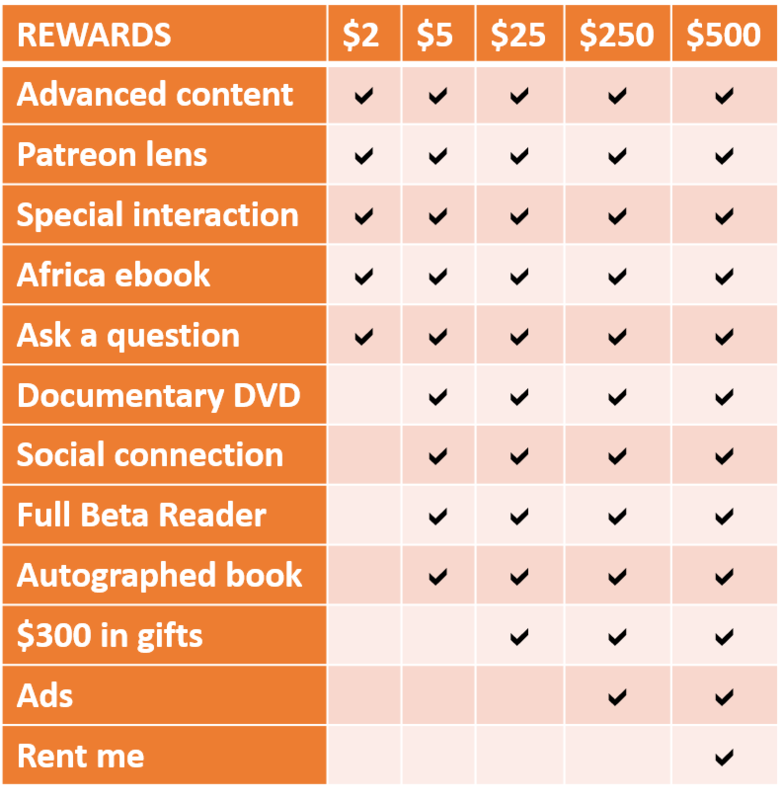 Do you want the best rewards in Patreon? I am NOT looking for charity! I dislike taking without giving something back. And simply giving you access to all my publicly available free stuff doesn't count as me "giving back." That's why I'm offering the best Patreon rewards ever. I've scrutinized 100 Patreon pages to see what others offer. For example, nowhere else on Patreon will you find a $25 reward that is as generous and as tangible the one on this page! For details about the rewards, see the Reward section on this page. In the video at the top, I mention the minimum reward being $1. In 2019, I raised the minimum to $2 because credit cards charge 30 cents per transaction; that's a fat chunk of $1, but a reasonable chunk of $2. My Patrons aren't interested in seeing a high percentage of their money going to Visa and Mastercard. What's the most important point? Don't ever think, "I'd be willing to give Francis $2 per month but then he'll think I'm a cheapskate! So I'll pretend that I never landed on this page and I will not give anything." Many of my Harvard Business School alumni will think like that. Most are rich so they feel they either should give generously or not at all. My closest friends will also think like that. Most will think that giving "only" $2/month is "insulting." If you're thinking like that, then I beg you to insult me every month! I truly and sincerely appreciate every single dollar I get. Maybe I'm too easy to please but I'd LOVE it if Bill Gates gave me $2 per month! If all the people who watch my videos, read my articles and listen to my podcasts were to give me $2 per month, then I'd have tens of thousands of dollars per month! Therefore, every dollar is extremely valuable. I learned that lesson when I spent 2013-2018 traveling throughout Africa. Sometimes I spent $2 per day (my monthly rent in Benin was $10)! Also, I'd rather have 500 people giving me $2 per month than to have one person giving me $1,000 per month. Your luck improves the more well connected you are. Thus, please don't leave this page before signing up for at least the $2 reward. It means a lot to me. What's almost more important than getting a reward? Whether you end up getting a reward or not, please do me one big favor that costs you nothing: share this page! Post this Patreon page on your Facebook wall. Post a photo of it on Instagram or Pinterest. Share my YouTube video about it. Hire Russian fake news creators to claim that this Patreon page has more patrons than anyone else! By sharing this Patreon page, you may convince 5 people to pledge $2/month! I'd love that! ...then, sign up for a reward now and tell your friends about it! Don't be shy. Neither Patreon nor I will see your credit card info. PayPal or Stripe will process your payment securely on the first of every month. Full Disclosure: Most Patreon creators hide how many patrons support each reward and how much money they get from their patrons every month. They do it because they're afraid that their patrons will vanish if they find out they're getting $10,000 per month. Still, I think patrons deserve full disclosure, which is why I will never hide those statistics from you. You'll become a Beta Reader of the first 15 chapters of The Unseen Africa book! On May 25, 2020 (60th anniversary of Africa Day), I plan to launch my third book: The Unseen Africa: 5 Years of Nonstop Overland Travel to All 54 African Countries. Now you can read the first 15 chapters! a) I will listen to your editorial input. I may rewrite parts of the book to reflect your advice! b) I will credit you on my website as one of my Patreon Beta Readers! I'll answer one question from you on my monthly Ask Me Anything (AMA) podcast/ video. Ask a new question every month! You'll get podcasts and articles before anyone else via my special Patreon RSS feed. I'll use the Patreon Lens to give you some behind-the-scenes dirt. Your comments, discussion, and voting on polls will help me focus on producing content that you love. You get a special Patreon Flair (i.e. Badge) next to your username whenever you participate in the WanderLearn subreddit. You will be invited anytime that I have a Patreon Live Chat, Patreon Live Video Stream, or Google Hangout! BONUS! You will get my massive upcoming ebook, The Unseen Africa, when it's 100% done in mid-2020! 1) Access to ALL the chapters of The Unseen Africa as I am writing them, not just the first 15 chapters. 2) Two physical and autographed copies of The Unseen Africa book a few months before the general public gets it! 3) The DVD of The Unseen Africa documentary in 2020. BONUS #1: I will connect with you on whatever social media platform you prefer, including Facebook, Instagram, Twitter, or Pinterest! BONUS #2: You'll also get the reward listed above! Every month, you will bank $25 of credit that you can use to get surprise gifts from me in the mail! For example, after 10 months of support at this level, you will have earned $250 worth of tangible gifts from me. A yearlong membership equals $300. My eBay account gives you an idea of some of NEW gifts I could send you. How is this possible? Even though I'm just a D-list celebrity, manufacturers send me free products to review/endorse everyday. I can't keep most of them. I'd rather send them to my favorite Patrons! It's a win-win! You should accumulate at least $150 of credit before cashing in on a gift (i.e., maintain this reward for 6+ months). This is to minimize my time spent fulfilling orders and to improve your gift value (by minimizing shipping costs). If you do not have a USA shipping address, I will send you a $200 gift for every year that you sustain this tier. Sorry, international shipping is expensive and complicated. Tell me what you prefer so that you get gifts that you love. Tell me your size (in case you'd like new clothes or shoes). If you want gifts for your family & friends, include their preferences too. The more you specify your preferences, the more likely I'll mail you something you love. I don't want to ship you an XL Patagonia jacket if you're a hobbit and you don't have anyone to gift it to. There are no refunds or returns because that would create a logistical nightmare. If you dislike a gift: (1) let me know; (2) please give it away to someone who will appreciate it; (3) I promise to make it up to you on your next gift. If you dislike surprises, I can tell you what the gift is before mailing it to you. If you dislike it, I'll give you other options until you find something worthwhile. If you'd like to get more valuable gifts, increase your monthly pledge amount. Example: Give $50/month and you'll get $600 in products per year. To sum up: I'll be your shopping elf for the holidays and birthdays! I will ship you nearly $300 of amazing physical gifts in 1 or 2 mailings per year!If you'd rather help me than Jeff Bezos, then subscribe to this reward!This is the best tangible reward on Patreon (based on value received per dollar given)! You will definitely get your money's worth! BONUS: You will get all the rewards listed above! As long as you keep sponsoring at this tier level, I will keep promoting whatever you want me to promote on my monthly creations! That means that at the end of every month, I'll mention your favorite website/organization on four podcasts, two videos, and four articles. That's 10 ads for the price of one! BONUS! You get all the other rewards too! In 2020, this reward will give you fewer ads so book now! Would you like me to present to your organization? Or would you like me to guide you (or your group) somewhere on this planet? Good news: I can be rented. I'm a TEDx speaker who can speak about many topics. I can also guide a group in the wilderness or foreign lands. My daily fee is $2,000. I will cover my travel expenses to any place in the world, which makes my daily rate much more affordable than it appears. After you get this reward, tell me the date (4+ months down the line) of when you'd like me to serve you. In 4 months, you'll have accumulated $2,000 in credit which you can cash in. What if you accumulate more than $2,000? Rent me for more than one day! Rent my wife too! (That sounds a bit perverted, doesn't it?) She would provide a unique African perspective since she's been to 31 African countries with me. Her rate is half mine. I can bring boxes of books which I'll autograph for all the attendees of the event. I can bring magical mystery gifts (see the $25 reward above) which you can use as giveaways or to auction off at your event. I will raise my rates in 2020, so book now to lock in this rate! 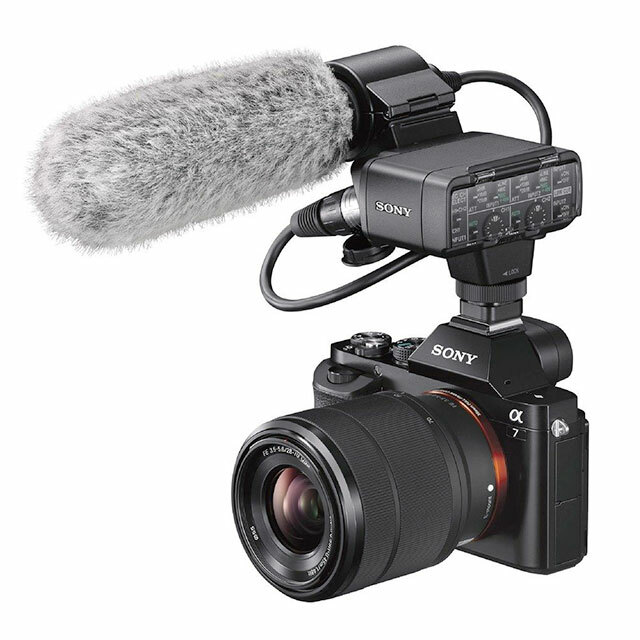 If I reach this milestone, I will be able to afford a pro camcorder and related gear in 2019. That means you'll enjoy higher quality videos!